Have you heard the one about the archaeologist, the physicist and the mineralogist? 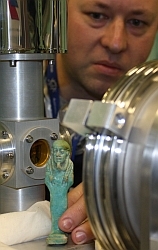 It’s not just the beginning of a good joke, it’s a team using the Australian Synchrotron to help reveal the methods used to make ceramics and jewellery in ancient Egypt during the reign of Pharaoh Akhenaten. La Trobe University archaeologist Mark Eccleston is investigating the use of metals, primarily copper and copper alloys such as bronze, in Egypt during the New Kingdom (from around 1500 to 1100 BC). The work focuses on the site of Amarna, which was established as a royal capital during the reign of Pharaoh Akhenaten, who completely revolutionised Egypt’s religious and political landscape. Recent excavations at Amarna show that the metalworking industry and the faience industry were sometimes located together. Faience is a quartz-based, glazed material that is often light blue or green in colour due to copper or bronze. From a broader perspective, identifying the raw materials will also provide insights into the micro-economic aspects of the industry, trade and distribution of raw materials in the wider economy and how different trade activities were organised within wider city life. Mark is working closely with La Trobe physicist Peter Kappen, with assistance from Museum Victoria mineralogist Dermot Henry, and Kia Wallwork and other beamline scientists from the Australian Synchrotron. Mark and Peter are using the x-ray absorption spectroscopy (XAS) and powder diffraction (PD) beamlines at the Australian Synchrotron with additional XAS studies at HASYLAB (Hamburg synchrotron radiation laboratory) in Germany. Mark says their latest visit to the Australian Synchrotron XAS beamline, in June 2010, has “advanced our knowledge of the structure of faience and allowed us to direct future research proposals to target areas of interest identified in work to date. Mark and Peter will travel to HASYLAB in September for XAS work. The HASYLAB results will contribute to a reference database of results that the team can use to plan future work on the PD and XAS beamlines at the Australian Synchrotron. 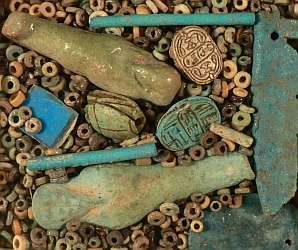 Mark Eccleston from La Trobe University is studying ancient Egyptian artefacts coated with a blue-green glaze called faience.